Ace your communication skills, know your numbers, put a woman in charge, and never hire your friends and family if you want your business to succeed, says billionaire investor and judge of hit business pitching show "Shark Tank" Kevin O’ Leary. 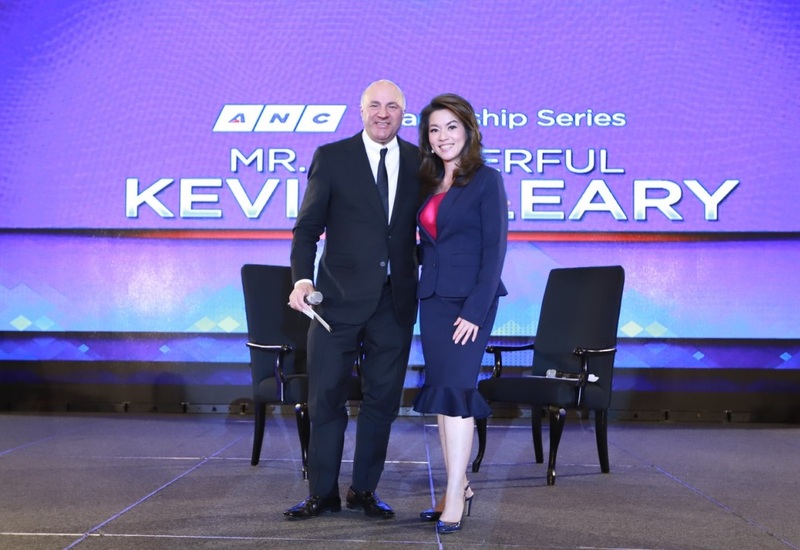 Businessmen, entrepreneurs, executives, and fellow venture capitalists in Manila got a taste of the cold hard truths of business from Kevin, the billionaire business investor famously known as “Mr. Wonderful” in the award-winning business-themed program “Shark Tank," on the latest leg of ANC, the ABS-CBN News Channel’s Leadership Series last Monday (November 12) at the Sofitel Philippine Plaza. Kevin, a venture capitalist whose "big break" in business came when he sold a software company for more the $4 billion dollars, became famous in pop culture on "Shark Tank," where he heads a panel of "shark" judges that grill entrepreneurs who think they have a winning business idea and eventually either reject the business proposals or invest in them. He shared his insights from decades’ worth of both success and failure in business with his signature no-nonsense approach to mentorship, beginning with getting a business idea noticed. “It takes 90 seconds, max, to win or lose potential investors. If you’re still talking five minutes later you’re dead—because in life, in business, in politics, if you can’t explain where you’re going, no one will follow you,” said Kevin. According to the founder of the O’Leary Financial Group, whose business interests include investments around the world including the startup companies he discovered on "Shark Tank," a good business starts from an idea that people will buy into, but entrepreneurs have to equip themselves with the right skills and data to make it come to fruition. Kevin, who built his business empire from the ground up and has had his own share of failures, also said it’s important to know when to “let go” in business and advised entrepreneurs to give a venture a three-year trial period. The TV judge and mentor, who also authored two best-selling books on business, shared tips for expanding business and based on data gathered from his own companies, some of which could raise eyebrows of traditional businessmen. One of this is to hire women CEOs, especially in start-up companies where time management and smart targets are integral to overcoming the first initial surge of sales and making it grow from “a $5 million company” to a “$25 million company.” He explained that women tend to set smarter targets, ensuring lower employee turnover and ultimately resulting in more savings and more profit. For business to have longevity, Kevin also warned against nepotism and friendship in business, because you should always want to hire the best person for your businesses. Finally, Kevin advised the attendees to take risks in business, and when success is found, to pass it on and teach it to the next generation. “When you’re an entrepreneur, you start a business, you create jobs, and that’s the best thing you can do for people,” said Kevin. “I believe if you’ve been successful as an entrepreneur, you owe the next generation a roadmap, not just about your successes but more importantly about your failures to help them not make a mistake,” he said. The event was moderated by award-winning ANC news anchor Cathy Yang, who also moderated the first edition of the ANC Leadership Series featuring British billionaire and Virgin Group founder Sir Richard Branson in 2016. Cathy also had an exclusive one-on-one interview with Kevin where they discussed investing in the Philippine market, real estate values, and more, which will air soon on "The Boss" on ANC. Kevin O’ Leary is the fifth international speaker brought to the Philippines by ANC, the country’s premier 24/7 all-English cable news channel, in the past three years after Branson, former US Secretary of State Madeleine Albright, Mandalay Entertainment Group chairman and CEO and executive chairman of the Golden State Warriors Peter Guber, and leadership guru Stephen M.R. Covey. For news and information, watch ANC, your news channel, your partner on cable. Watch ANC in high definition on cable on ANC HD. You may also visit news.abs-cbn.com/anc or follow @ANCalerts on Facebook and Twitter. For updates, follow @abscbnpr on Facebook, Twitter, and Instagram or visit www.abscbnpr.com.